Kindle And Me...: Girl of Nightmares by Kendare Blake (Interview + Giveaway). Girl of Nightmares by Kendare Blake (Interview + Giveaway). I’m sure you’ve been asked this before but what inspired you to write a story about a dead girl and a ghost hunter? It might sound weird, but the whole idea for writing ANNA came from the urge to play the video game SILENT HILL. But I was scared to. I have a thing about SILENT HILL, I love the games, and the atmosphere, but I'm too chicken to make it through on my own. So I make someone else play it while I hide behind my hands and scream at them what they should be doing. Anyway, from that urge, came the urge to write something gory, something horrifying. And there was Anna. If you had to describe Girl of Nightmares in 3 words, what would they be? Ooh. Hmm. Quest of Blood. Which do you prefer - writing from a male or female POV? I like both. 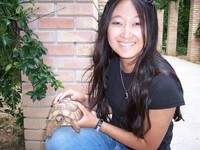 Violet, from my first novel, was a nineteen year old college student. Cas is a seventeen year old ghost hunter. I don't think it would be possible for me to write a VERY feminine female. That would be an interesting challenge, actually. How many books are you planning to write in the Anna series? GIRL OF NIGHTMARES is the last. Unless Cas changes his mind. The Nightmare on Elm Street series, of course! While they're not technically scary, they're a lot of fun. I prefer the one where the dog pees fire. Which one is that? Three? Four? I think four. Which genre do you like reading the most? I guess my two favorites would be philosophical literary and dark or weird fantasy. But I don't like to genrelize! And I apologize for using that word. I swear I'm not trying to make "fetch" happen. Ever? That's tough. The one that springs to mind right now, not my favorite is one by the philosopher Nietzsche, and I might be paraphrasing: "I despise myself, but also esteem myself, for despising." Totally random but pick one – Harry Potter, Twilight or Hunger Games? Harry Potter. Is it weird that I haven't read the other two? The Hunger Games is at the top of my pile. ALL TIME? These are hard questions. How about, The Mists of Avalon? You have another book coming out next year – AntiGoddess - can you tell us a bit about it? Love to. ANTIGODDESS kicks off a trilogy about dying greek gods. Each of them is dying a particular, horrifying, slow death, and Athena and Hermes sort of band together to figure out why. Along the way their paths cross with mortals, teens who are reincarnated heroes. As they seek answers, other gods also seek their own solutions. Some of them want to take the world down with them, and some want to save it. It's death and blood and greek. And love. Kendare's clearly super fun to talk to, I loved her answers. I'm a fan of all things horror myself! Okay, okay, now for the giveaway! 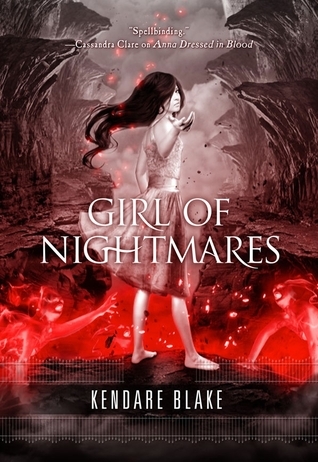 Prize is a pre-ordered copy of Girl of Nightmares. Honestly, I haven't read Anna Dressed in Blood yet. It's on my shelf though. Didn't get the chance to read it yet :( Great interview! Lol. Love that random pick of hers. This is the last book? Oh, no. I love Cas and Anna! Anna Dressed in Blood is one of my favourite read last year. I'm looking forward for Anna to be reunited with Cas again. I read Anna Dressed in Blood, and I really enjoyed it. I am excited to read how the story develops. Thanks for the interview and giveaway! Hopefully I'll also be able to pick up Girl of Nightmares soon! Loved the interview! Her upcoming book AntiGoddess sounds really good! No, I haven't yet. It is on my TBR list, along with this one. To be honest, I havent read Anna, Dressed in Blood yet. But if I was lucky enough as to win... I will buy it so I can read them in order. Thanks for the giveaway! I havent read it yet but I'm intrigued! Love Anna Dressed in Blood! I have no clue how this next one will end but I can't wait to find out! Her new series sounds fascinating! Greek mythology? Count me in! I haven't read the first book yet. I have on my shelf but I was waiting closer to the release of book #2. I haven't read the entire THG series. But I agree, Harry Potter by far! I LOVED Anna! I can't wait to read the sequel! Anna Dressed In Blood was freaking amazing. I loved it so much I even ordered it a couple of months ago. Can't wait to read more spooky scenes in the second book. I loved Anna Dressed in Blood and can't wait for Girl of Nightmares just to get more of all of it. Loved the interview, Kendare seems like a very interesting person and someone I would love to meet. I haven't read Anna dressed in blood yet... So, I don't know what to expect of the books, but I really want to read those books! Thanks for the giveaway! I didn't have time to read Anna Dressed in Blood yet, but I've read a lot of nice things about it! I really like the idea of her new series, looking forward to reading it! I've read Anna Dressed in Blood and I absolutely loved it! I can't wait to read the sequel! I haven't read Anna yet but I have been meaning to. So many books, only so much time, y'know? Girl of Nightmares looks great, thanks for offering it in this giveaway. I have not read Anna Dressed in Blood, but it's on my TBR list to be read ASAP! Thanks for the giveaway! I haven't read Anna Dressed In Blood yet but I have it on my TBR pile. I hope I can finally read it this summer! I haven´t read Anna Dressed in Blood. But it looks very good. Your interview is wonderful. I have not read Anna yet, but its been on my wish list since I heard of it. Loved the premise! The interview was fun to learn more about the books and author. I have not read Anna Dressed in Blood, but my sister has a copy and I need to go borrow it from her soon! =) Thanks for the giveaway! I read Anna & loved it. I really like how creepy it is. They're saying that horror is "the next big thing" in YA. I hope they're right! Thanks for the chance to win! I've read Anna Dressed in Blood and just loved it! I'm looking forward to this book so, so much. I haven't read it yet - I'm planning to this summer! Can't wait :) thank you for the giveaway! Love the cover of this as well. I have read Anna Dressed In Blood. I loved it. Really, LOVED. It was so amazing but had such a horrid ending, I was initally too pissed to want to read another one....but I got over that very quickly. I want to see what happens between Anna & Cas. I loved them. Thanks for the giveaway! Thanks for the giveaway! I haven't read Anna Dressed in Blood yet, but it's patiently waiting on my shelf. I've heard such awesome things about it though! Loved the first book! I liked the horror aspect of it the most--not something you usually see in that detail. Can't wait for the second book! I have read "Anna Dress in Blood" and I couldn't rave about it more! I loved it! I havent read Anna D in B but i did order a copy! I cant wait to start reading it! I just got Anna Dressed In Blood and will start to read it this weekend! Can't wait - looks like the second book will be as good as the first! I loved Anna Dressed in Blood! It was definitely different than what I usually read but great nonetheless. I can't wait for Girl of Nightmare! Not yet! But I'd love to read that and of course, it's sequel too. :) The idea is really unique! I haven't read it yet but I do have a copy. I hate the wait between series books so I often waittill I have at least two before starting it. Ahhh, I couldn't be MORE excited to read Girl of Nightmares! I just loved Anna Dressed in Blood so much. :D! Thanks so much for the giveaway! First of all, AntiGoddess sounds amazing and I will definitely be reading that trilogy. I loved the interview. Kendare Blake seems incredibly funny, and that is my kind of person. I love that Anna came into being because she loves Silent Hill but was too scared to play it by herself. If there is a better story for how a book happened than that out there, I would be surprised. I loved Anna Dressed in Blood with a passion. Seriously, loved it. I cannot wait for Girl of Nightmares. It will be in my hands and my nose will be stuck in it the day it comes out. I'm so excited! Thanks so much for the chance to win! I haven't read Ann Dressed in Blood but I will soon and I am looking forward to being able to continue the series by winning this book..lol. Oh my gosh, I'm in the middle of Anna Dressed in Blood and I love it! I started reading it in the hospital because I figured I wouldn't be scared there. Wrong! lol I am impatiently waiting for Girl of Nightmares now. I haven't read the book yet but I will definitely do so! Loved the interview! I haven't read Anna Dressed In Blood yet, I like to have all the books of a series before starting, nothing worse than waiting. I haven't read Anna Dressed in Blood ye, but it's on my TBR pile :) I can't wait to read it. Thank you for the interview! Thank you for this awesome interview and the wicked giveaway!!! I LOVED Anna Dressed in Blood - Cas, the creepiness, Anna's terribly sad story - I can't WAIT to read Girl of Nightmares! I haven't read the Anna Dressed in Blood yet. I curious about this book. This was great interview, i enjoyed it. Thank for sharing and giveaway!! I have not read Anna Dressed in Blood but Kendare is going the be the featured author on my blog in August and I can't wait to read it. I haven't read Anna Dressed in Blood, but I did just recently win it from another blog. I can't wait to read it and would love to have this one to go along with it! Thanks for the chance to win! I can't wait to read the follow up. I want to read more about Cas - he is a great character and the story of Anna Dressed in Blood was so unique. Haven't read it yet, but plan to. Have not read it, but looking forward to read both! I haven't read Anna Dressed in Blood, but it's pretty high up on my TBR list. I've heard such great things about it! Read it and loved it! I really just want to see where Blake take the story. Anna Dressed in Blood was one of my favorite reads last year, I can't wait for Cas and Anna to get back together and have some really bad nightmares! I have Anna Dressed in Blood in my TBR. Looking forward to reading it and this sounds just as good. I haven't and the book is on my TBR list. I think I should bump it up. I've heard great things about the story. I have read Anna Dressed in Blood and loved it! I can't wait to find out the outcome of Cas and Anna in Girl of Nightmares. The interview was interesting. Haven't yet but I really want to!!! I have not read Anna Dressed in Blood yet. I am really looking forward to though. I love the covers for both books and the sound great!!!! Anna Dressed in Blood was amazing. I was both intrigued, enchanted, and a little squicked out all at the same time! Plus, the books have one of the most amazing cover artists! "Anna Dressed In Blood" was my very first YA story (out of my YA age range) and I absolutely LOVED it. It was so much fun and a refreshing change from general adult fiction that has become very monotonous! The one thing I cannot get out of my head that I LOVED about one part of Kendare Blake's character words in particular were when they were (I don't want to give spoilers so will try to be vague) anyway, I loved that during some points in the story, when all the characters were together during a moment when they had to do something that made them feel like total dorks, that Kendare actually had the characters verbally expressing themselves as feeling so stupid doing what they had to do to rid the ghost (Yeeeeah, that was a run on sentence, hope it made sense?). If she hadn't done that and as a reader reading the silliness of solving their situation I probably would have laughed and put the book down. I found it a genius move on the author's part to have her characters poke fun at themselves. In the sequel I can honestly say, after having read "Anna" and loving it, whatever Kendra brings to us I'm certain it's going to be fun, creepy and as good if not better than the first. The pacing was great. Not a single moment where I felt, okay let's hurry this up or OMG this is boring....Not at all through the entire book from page one to the last. Kept you hooked, interested and wanting more throughout and when it was over. I guess if I did have to say though, I would love a bit more spine chills. Either way it was perfect. "Anna Dressed In Blood", from the time I finished reading it then ran to Amazon immediately for the sequel it was then permanently placed on my Goodreads profile sitting with my other faves right in view on my favorites shelf. I have few faves from all genres and this was definitely one of them. replying to my own msg: Typo...I meant thank you to Kendare Blake....not Kenbare SMH. I don't know how I managed that horrible typo. Love the interview! I think it's great that you got the inspiration to write Anna Dressed In Blood from a video game! I have not read Anna yet but would love to win here and have both to read at the same time! I can't wait to read them! Thank you for the giveaway! I loved Anna Dressed In Blood and can't wait to read Girl of Nightmares! Amazing writing! Thanks!